Collage by Carrie Bloomston is an unusual group of cotton prints featuring strips and scraps of newsprint mixed into the designs. Text on fabrics is always a nice detail, but in this era of digital media, newspapers - and collage for that matter! - are becoming more the exception than the norm, which makes this designer's choice of subject particularly appealing. 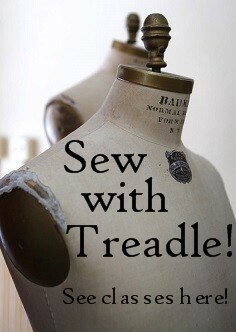 With the finest in apparel fabrics and designer prints, you'll always find something special at Treadle Yard Goods. Today we're reviewing a group of new crafting books. Forest Fairy Crafts, with its eye-catching, colorful characters, is almost irresistible! Projects for a village of adorable fairy characters, made from simple supplies like wool felt and yarn, with sweet embellishments os buttons, sequins, and more. Stitch Zakka is full of embroidery and patchwork projects inspired by the Japanese "zakka" style, an approach to crafting and decor meant to fuse modern grace with retro charm, merge Japanese aesthetics with Scandinavian, and create something beautiful, useful, and meaningful. Sweet & Simple Handmade by Melissa Wastney conveys feelings of calm delight. Working with cool, neutral tones, this book features projects meant to nurture the sweet simplicity of childhood. With sewing, knitting, and upcycling from old garments, the author shares projects for garments, toys, and more, to help you cherish the little ones in your life with handmade tokens of affection. All these and more are available at Treadle Yard Goods! A lovely group of new striped knits in the store. Each piece merges a saturated color with heathered charcoal gray for perfectly blended style. Perfect as a dress, or a tee with jeans, stripes are polished but never too dressy. We have so much new and exciting stuff in the store right now, I'm having a hard time keeping up! Today we're reviewing a trio of breathtaking new patchwork and quilting books. The new Shots and Stripes book by color guru Kaffe Fassett is truly gasp-worthy. Using only his lines of shot and striped cottons, Kaffe explores the incredible potential of color blending with these 24 quilted projects. Colorific by local Minnesota quilter and author Pam Goecke Dinndorf focuses on color and fabric selection for high-impact quilts. The quilts in the book were photographed entirely in Northern Minnesota, against the backdrop of stunning natural scenery. Patchwork, Please! is another current favorite in the shop. Featuring smaller projects in the Japanese Zakka style, this book is full of fun and quirky patchwork pieces. There's a book for every quilter at Treadle Yard Goods! This kitschy new fabric collection from Moda is inspired by vintage paint-by-number kits. Each print is partially filled in with color, leaving some sections blank, to resemble an in-progress paint-by-number painting. Look closely and you'll see the little numbers! Love the deer and autumnal trees. And of course, your paint-by-number project wouldn't be complete without the paint! At Treadle Yard Goods, we hand pick only the best designer cotton prints. Stop by and see what else is in store! We all love a bright pop of color, but sometimes something a little quieter is required. The beauty of an elegant grayscale is far more subtle, but there are definitely times when you want a stash of gray in your wardrobe; either as a backdrop for brighter pieces or for a subdued, classic statement all on its own. We have a lovely assortment of new knits in the store in classic grays, including sequined, hounds-tooth, stripes, brocade, and more. We have a beautiful new autumn selection of fabrics at Treadle from Liberty of London. These cotton lawns have an amazing silky smooth hand and rich, saturated colors. The prints range from scattered flora and fauna to geometric dots, blended with impeccable color sense and attention to detail. There's really nothing like Liberty! If you need some ideas for what to do with all these luscious lawns, check out the new book Liberty Love. With 25 projects for clothing, crafts, and the home, and an envelope of full-size patterns, you'll never have to wonder what to do with a Liberty print again. We have a fun new group of printed jersey in the store from designer Riley Blake. Featuring dots, stripes, and chevrons, these cotton knits pack a bright punch. The large scale gives them a great impact, but it's not too large to be wearable - try these knits in a casual dress or skirt. The knit's soft drape will keep the garment flowing smoothly. Any of these would also be great in a basic tee for kids! We have several new fabrics in the store from Alexander Henry, and one of my favorites is this charming village scene, called Everyday Eden. Packed with detail, this print paints a scene of people enjoying an idyllic summer day among the flowers, houses, animals, and trees. The scale is large enough for a wall hanging or quilt back but not too big for a whimsical skirt or a little girl's dress. We have a trio of sweet new ribbons in the store. These very wide, lightweight ribbons have rows of little ribbon flowers packed closely along the length. The edges are wired to help hold the shape of a bow, or you can easily remove the wire for sewing the ribbons to garments. These would make a perfect sash for a flower girl's dress, or use one to edge the hem of a plain pencil skirt to up the wow factor. We have so many more exciting trims in the store! Come check 'em out.